Renowned German lens manufacturer Carl Zeiss’s latest Milvus range of DSLR lenses for Canon and Nikon are marketed as offering high-quality optical performance in a similar price bracket to such high-resolution options as Sigma’s Art range or Canon’s L-series lenses. The manual-focus Milvus range offers an all-metal dust and splash proof construction, a large rubberized focus ring, smooth manual focus control, as well as engraved focus distance and depth of field scales. The Nikon version also offers a manual control aperture ring that can be switched to de-click mode for video work. If you’ve invested in Nikon’s D500 APS-C DSLR, you’re no doubt delighted with its excellent build, tilting touch-screen LCD, new joystick control, chunky ergonomic handgrip, and large viewfinder. It’s a high-performance APS-C option, too, that includes the 153-point improved tracking autofocus system and Expeed 5 processing engine from Nikon’s flagship D5, as well as 10fps burst shooting of up to 200 14-bit RAW files. After releasing the highly-regarded 35mm and 24mm f1.4 DG HSM Art series primes, Sigma has introduced an ultra-fast, high-grade 24-35mm f2 DG HSM Art zoom intended to appeal to enthusiasts who might favor convenience over outright lens speed. Available in Canon and now Nikon lens mount versions, the Sigma 24-35mm f2 DG HSM Art is a constant-aperture, full-frame zoom designed to rival the equivalent focal length f/2 and f/2.8 primes in image quality, and tempt people away from standard zooms. Tamron has added a new moderate wide-angle Nikon F-mount SP 35mm f/1.8 Di VC USD lens to its range. It features a sophisticated optical layout with VC image stabilization, two ED glass elements and two aspheres. Read on to find out how well this new model performs. The Nikon AF-S Nikkor 24mm f/1.8G ED (Nikon 24mm f/1.8G) is the seventh f/1.8 prime G-type lens to be added recently to the Nikkor lineup. Designed to maximize the resolution potential of sensors such as the 36Mp Nikon D810, these latest lenses have been breaking new ground for optical performance on Nikon DSLRs. Sigma 24mm F1.4 DG HSM A Nikon lens review: Best model for Nikon users? 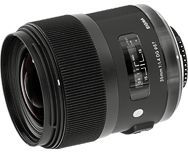 Initially launched with a Canon EF mount, the high-end Art series Sigma 24mm f1.4 DG HSM is now available in Nikon F mount. Read on to find out how well this new wide-angle model performs.